Aim: Invasive cervical cancer is proceeded by a phase of preinvasive disease that is slow to progress and can be detected, treated, and collectively referred to as cervical intraepithelial neoplasia (CIN). Several excisional and ablative treatments for CIN have been studied, with loop electrosurgical excision procedure (LEEP) and cryotherapy being the two most commonly utilized. The objective of this systematic review and meta-analysis of randomized controlled trials (RCTs) was to compare the compare harms and benefits of LEEP versus cryotherapy in women with CIN. Methods: Electronic databases were searched from their inception until May 2018. We included all RCTs comparing cryotherapy versus LEEP in women with CIN. We included trials evaluating both HIV-seropositive and HIV-seronegative women. The primary outcome was the persistence of the disease at 6-month follow-up. Meta-analysis was performed using the random-effects model to produce summary treatment effects in terms of relative risk (RR) with 95% confidence interval (CI). Results: Four trials, including 1035 women with CIN, were identified as relevant and included in the meta-analysis. Women who received LEEP for CIN had a significantly lower persistence at 6-month follow-up biopsy (RR: 0.87, 95% CI: 0.76–0.99) and significantly lower recurrence at 12-month follow-up biopsy (RR: 0.91, 95% CI: 0.84–0.99) compared to those who received cryotherapy. No between-group differences were found in the complications rate, but the analyses were not powered for these outcomes. Conclusions: In women with CIN, treatment with LEEP was associated with a significantly lower risk of persistence disease at 6 months and recurrence disease at 12 months compared to treatment with cryotherapy. In the developing countries, cervical cancer is the most common cancer in women, with the highest rates in sub-Saharan Africa, Latin America, and South and South East Asia. Invasive cervical cancer is proceeded by a phase of the preinvasive disease that is slow to progress and can be detected, treated, and collectively referred to as cervical intraepithelial neoplasia (CIN). CIN can be confirmed histologically from a biopsy sample and divided into three stages (CIN1, 2, and 3). Thus, the aim of this systematic review and meta-analysis of randomized controlled trials (RCTs) was to compare the compare of LEEP versus cryotherapy in women with CIN. This review was performed according to a protocol designed a priori and recommended for systematic review. Electronic databases (i.e., MEDLINE, PROSPERO, Scopus, ClinicalTrials.gov, EMBASE, ScienceDirect, the Cochrane Library, Scielo) were searched from their inception until May 2018. Search terms used were the following text words: “LEEP,” “cryotherapy,” “cervical cancer,” “CIN,” “intraepithelial neoplasia,” “electrosurgical excision,” “Pap test,” “meta-analysis,” “meta-analysis,” “review,” “randomized,” “clinical trial,” “randomized,” and “clinical trial.” No restrictions for language or geographic location were applied. In addition, the reference lists of all identified articles were examined to identify studies not captured by electronic searches. The electronic search and the eligibility of the studies were independently assessed by two authors (MB and GS). Differences were discussed, and consensus reached. We included all RCTs comparing cryotherapy versus LEEP in women with CIN. We included trials evaluating both HIV-seropositive and HIV-seronegative women. Any grade of CIN (CIN1, CIN2, or CIN3) was included. CIN was defined as biopsy-proven squamous intraepithelial lesions (SILs). Quasi-randomized trials (i.e., trials in which allocation was done on the basis of a pseudorandom sequence, for example, odd/even hospital number or date of birth, alternation) were excluded. Trials evaluating other therapies other than cryotherapy and LEEP were also excluded. The risk of bias in each included study was assessed using the criteria outlined in the Cochrane Handbook for Systematic Reviews of Interventions. Seven domains related to risk of bias were assessed in each included trial since there is evidence that these issues are associated with biased estimates of treatment effect: (1) random sequence generation, (2) allocation concealment, (3) blinding of participants and personnel, (4) blinding of outcome assessment, (5) incomplete outcome data, (6) selective reporting, and (7) other bias. Review authors' judgments were categorized as “low risk,” “high risk,” or “unclear risk” of bias. Two authors (MB and GS) independently assessed inclusion criteria, the risk of bias, and data extraction. Disagreements were resolved by discussion. Data from each eligible study were extracted without modification of original data onto custom-made data collection forms. Differences were reviewed and further resolved by common review of the entire process. Data not presented in the original publications were requested from the principal investigators, if possible. All analyses were done using an intention-to-treat approach, evaluating women according to the treatment group to which they were randomly allocated in the original trials. Primary and secondary outcomes were defined before data extraction. Outcomes were assessed at the time of biopsy follow-up at 6 months and at 12 months after the procedure. If women did not receive for any reason (e.g., lost to follow-up, pregnancy) biopsy at follow-up, they were excluded from the analysis. All authors were contacted for missing data. The primary outcome was the persistence of the disease, defined as disease (any grade of CIN) present at 6-month follow-up after treatment. The secondary outcomes were recurrence, defined as disease (any grade of CIN) present at 12 months after treatment and treatment complications. The data analysis was completed independently by two authors (MB and GS) using Review Manager version 5.3 (the Nordic Cochrane Centre, Cochrane Collaboration, 2014, Copenhagen, Denmark). The completed analyses were then compared, and any difference was resolved by discussion. Statistical heterogeneity across studies was assessed using the Higgins I2 test. Meta-analysis was performed using the random-effects model of DerSimonian and Laird to produce summary treatment effects in terms of relative risk (RR) with 95% confidence interval (CI). Potential publication biases were assessed statistically using Begg's and Egger's tests. We planned the following subgroup analyses for the primary endpoint: (1) HIV-seropositive versus HIV-seronegative women and (2) trials on CIN2 and CIN3 only. The meta-analysis was reported following the Preferred Reporting Items for Systematic Reviews and Meta-Analyses statement. Four trials, including 1035 women, were identified as relevant and included in the meta-analysis [Figure 1].,,, Data from one trial were also obtained by a secondary analysis published only as abstract. Publication bias, assessed statistically using Begg's and Egger's tests, showed no significant bias (P = 0.47 and P = 0.51, respectively). Statistically, heterogeneity within the trials was low with no inconsistency (I2 = 0%) for the primary outcome. The quality of the RCTs included in our meta-analysis was assessed using the criteria outlined in the Cochrane Handbook for Systematic Reviews of Interventions. Most trials were at low or moderate risk of bias. All the included studies had a low risk of bias in “random sequence generation.” The appropriate method of sequence generation was used to assigned women to the treatment groups. Adequate methods for allocation of women were used in all the trials. None of the trials reported whether or not the outcome assessor was blinded, except for the trial of Chirenje et al. where the investigators collecting and analyzing the data were blinded to the treatment mode [Figure 2]a and [Figure 2]b. [Table 1] shows the characteristics of the included clinical trials. Of the 1035 enrolled women, 516 women were randomized in the LEEP group and 519 in the cryotherapy group. LEEP was usually described as the following: staining the cervix with acetic acid solution; abnormal areas were identified and stained with Lugol's iodine; and local anesthetic was administered around the cervix. 20 mm × 8 mm loop was used to remove the lesion. Cryotherapy was usually described as the following: lesions were identified by colposcopy, freezing the lesions for two 3-min application of nitrous oxide separated by thaw [Table 2]. Mitchell et al. and Singh et al. included women with CIN1+, while Chirenje et al. and Smith et al. included only women with CIN2+ [Table 1]. Overall, a total of 200 women with CIN1 and a total of 835 women with CIN2–3 were included in the study [Table 3]. [Table 4] shows the primary and secondary outcomes. Overall, 94.9% of the women (982/1035) had histological biopsy results at the 6-month follow-up visit, and data were available for the primary endpoint. Pregnancy was the most common cause of loss to follow-up. About 72.9% of the randomized women (755/1035) had histological biopsy results at the 12-month follow-up. Women who received LEEP for CIN had a significantly lower persistence at 6-month follow-up biopsy (RR: 0.87, 95% CI: 0.76–0.99) [Figure 3] and significantly lower recurrence at 12-month follow-up biopsy (RR: 0.91, 95% CI: 0.84–0.99) compared to those who received cryotherapy. No between-group differences were found in the complications rate, but the analyses were not powered for these outcomes. LEEP was also associated with significantly lower risk of high-grade SIL (HSIL) at 6-month Pap smear follow-up (RR: 0.45, 95% CI: 0.28–0.75) and at 12-month (RR: 0.41, 95% CI: 0.26–0.65) Pap smear follow-up compared to cryotherapy [Table 4]. Subgroup analysis in trials including only women with CIN2 + and subgroup analysis in trials including HIV-positive only women concurred with the overall analysis in showing significant benefit of LEEP for the primary endpoint (RR: 0.89, 95% CI: 0.77–0.98 and RR: 0.88, 95% CI: 0.76–0.99, respectively). This meta-analysis of four RCTs, including 1035 women with CIN, showed that treatment with LEEP was associated with a significantly lower risk of persistence disease at 6 months and recurrence disease at 12 months compared to treatment with cryotherapy. The meta-analysis also showed a significant reduction of HSIL at 6-month and at 12-month Pap smear follow-up and nonsignificant benefits in the other secondary outcomes, including CIN3 at 6 and 12-month follow-up biopsy. No between-group differences were found in the complications rate comparing the two treatments with a nonsignificant increase in pain, infection, and bleeding in women receiving LEEP. However, the meta-analysis was not powered for these outcomes. This may be the first meta-analysis of RCTs comparing LEEP with cryotherapy in women with CIN. No prior meta-analyses are up to date and comprehensive in terms of included studies, and the number of women included in our analysis is the highest among all review available. Potential publication bias was assessed by statistical tests, and statistics suggested no publication bias. The statistical heterogeneity within the trial was low for the primary endpoint. Overall, >90% of the women had histological biopsy results at the 6-month follow-up visit for the primary endpoint. The major shortcoming of this review was the inclusion of only four trials. Given the intervention, none of the included trials were double blind. The meta-analysis was underpowered to detect significant differences in the complications rate. The American College of Obstetricians and Gynecologists and the American Society for Colposcopy and Cervical Pathology in the 2012 ASCCP Consensus Guidelines Conference recommended colposcopy for women with HSIL cytology. In the case of colposcopy and biopsy, women with CIN should be managed with either excision or ablation. Therefore, both LEEP and cryotherapy are reasonable and recommended treatment for women with CIN. No specific recommendations are made in HIV-positive women. HIV-positive women have an increased risk of cervical cancer, as well as an increased risk of procedure-related complications. Our review provided evidence that LEEP treatment is superior in terms of less persistence and less recurrence rate at 6 and 12-month follow-up visit compared to cryotherapy. Our study concurred with prior findings of Santesso et al. In summary, in women with CIN, treatment with LEEP was associated with a significantly lower risk of persistence disease at 6 months and recurrence disease at 12 months compared to treatment with cryotherapy. Parkin DM. Cancer in developing countries. Cancer Surv 1994;19-20:519-61. Castle PE, Schiffman M, Wheeler CM, Solomon D. Evidence for frequent regression of cervical intraepithelial neoplasia-grade 2. Obstet Gynecol 2009;113:18-25. McCredie MR, Sharples KJ, Paul C, Baranyai J, Medley G, Jones RW, et al. Natural history of cervical neoplasia and risk of invasive cancer in women with cervical intraepithelial neoplasia 3: A retrospective cohort study. Lancet Oncol 2008;9:425-34. Jones HH. Treatment of cervical intraepithelial neoplasia. Clin Obstet Gynecol 1990;33:826-36. De Vuyst H, Lillo F, Broutet N, Smith JS. HIV, human papillomavirus, and cervical neoplasia and cancer in the era of highly active antiretroviral therapy. Eur J Cancer Prev 2008;17:545-54. Massad LS, Riester KA, Anastos KM, Fruchter RG, Palefsky JM, Burk RD, et al. Prevalence and predictors of squamous cell abnormalities in Papanicolaou smears from women infected with human immunodeficiency virus-1. J Acquir Immune Defic Syndr 1999;21:33-41. Abraham AG, D'Souza G, Jing Y, Gange SJ, Sterling TR, Silverberg MJ, et al. Invasive cervical cancer risk among HIV-infected women: A North American multi-cohort collaboration prospective study. J Acquir Immune Defic Syndr 2013;62:405-13. Chamot E, Kristensen S, Stringer JS, Mwanahamuntu MH. Are treatments for cervical precancerous lesions in less-developed countries safe enough to promote scaling-up of cervical screening programs? A systematic review. BMC Womens Health 2010;10:11. Pfaendler KS, Mwanahamuntu MH, Sahasrabuddhe VV, Mudenda V, Stringer JS, Parham GP, et al. Management of cryotherapy-ineligible women in a “screen-and-treat” cervical cancer prevention program targeting HIV-infected women in Zambia: Lessons from the field. Gynecol Oncol 2008;110:402-7. Mwanahamuntu MH, Sahasrabuddhe VV, Pfaendler KS, Mudenda V, Hicks ML, Vermund SH, et al. Implementation of ‘see-and-treat’ cervical cancer prevention services linked to HIV care in Zambia. AIDS 2009;23:N1-5. Higgins JP, Green S, editors. Cochrane Handbook for Systematic Reviews of Interventions, Version 5.1.0. The Cochrane Collaboration; 2011. Available from: http://www.training.cochrane.org/handbook. [Last update on 2011 Mar 15; Last accessed on 2017 Nov 05]. Mitchell MF, Tortolero-Luna G, Cook E, Whittaker L, Rhodes-Morris H, Silva E, et al. Arandomized clinical trial of cryotherapy, laser vaporization, and loop electrosurgical excision for treatment of squamous intraepithelial lesions of the cervix. Obstet Gynecol 1998;92:737-44. Chirenje ZM, Rusakaniko S, Akino V, Mlingo M. A randomised clinical trial of loop electrosurgical excision procedure (LEEP) versus cryotherapy in the treatment of cervical intraepithelial neoplasia. J Obstet Gynaecol 2001;21:617-21. 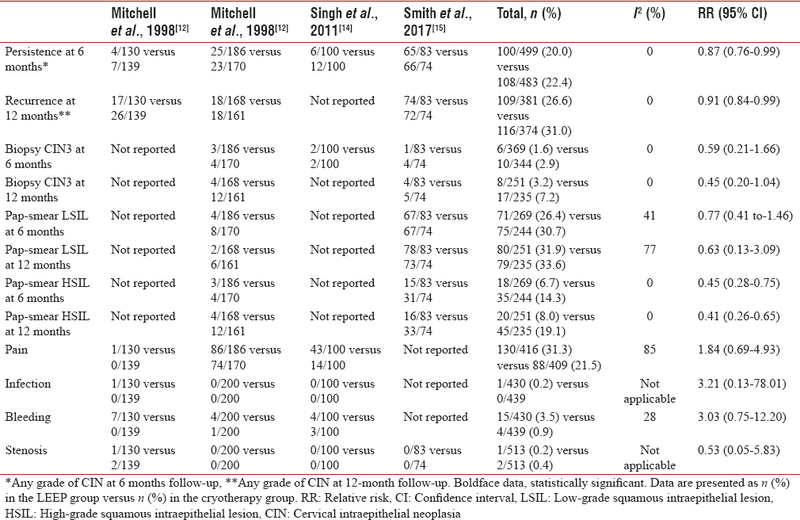 Singh A, Arthur B, Agarwal V. LEEP verses cryotherapy in CIN. J Obstet Gynaecol India 2011;61:431-5. Smith JS, Sanusi B, Swarts A, Faesen M, Levin S, Goeieman B, et al. Arandomized clinical trial comparing cervical dysplasia treatment with cryotherapy vs. loop electrosurgical excision procedure in HIV-seropositive women from Johannesburg, South Africa. Am J Obstet Gynecol 2017;217:183.e1. Chirenje ZM, Rusakaniko S, Akino V, Munjoma M, Mlingo M. Effect of HIV disease in treatment outcome of cervical squamous intraepithelial lesions among Zimbabwean women. J Low Genit Tract Dis 2003;7:16-21. Massad LS, Einstein MH, Huh WK, Katki HA, Kinney WK, Schiffman M, et al. 2012 updated consensus guidelines for the management of abnormal cervical cancer screening tests and cancer precursors. J Low Genit Tract Dis 2013;17:S1-27. Sansone M, Saccone G, Migliucci A, Saviano R, Capone A, Maruotti GM, et al. Screening for cervical carcinoma in HIV-infected women: Analysis of main risk factors for cervical cytologic abnormalities. J Obstet Gynaecol Res 2017;43:352-7. Sansone M, Sarno L, Saccone G, Berghella V, Maruotti GM, Migliucci A, et al. Risk of preeclampsia in human immunodeficiency virus-infected pregnant women. Obstet Gynecol 2016;127:1027-32. Santesso N, Mustafa RA, Wiercioch W, Kehar R, Gandhi S, Chen Y, et al. Systematic reviews and meta-analyses of benefits and harms of cryotherapy, LEEP, and cold knife conization to treat cervical intraepithelial neoplasia. Int J Gynaecol Obstet 2016;132:266-71.